Clearly the Harry Potter theme is going to be around throughout my bestie’s pregnancy. How can it not? 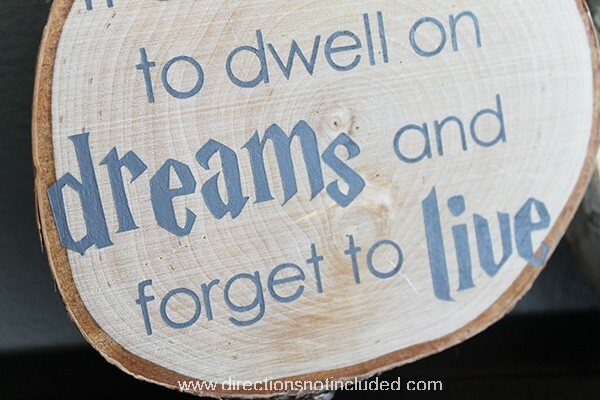 The room itself is not Harry Potter themed but that doesn’t mean we can’t add some Harry Potter nursery art to the mix. So far the nursery is lending itself to a modern, adventurer feel. 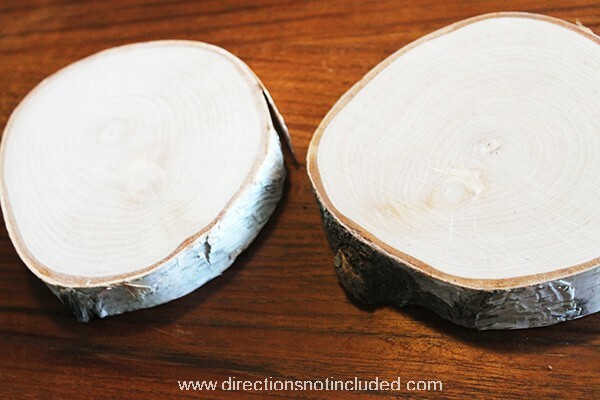 I picked up these birchwood wood slices at Michael’s a few weeks ago with no plan in mind. I have a bit of a craft hoarding problem. I randomly just buy things I have no concrete plan for (please tell me I am not alone!) Any way, here are the slices I bought. About 6 inches or so in diameter and a perfectly smooth surface to work with. So glad I bought them now because they are perfect for this. I used my Silhouette to design and cut out vinyl to use for my stencil. 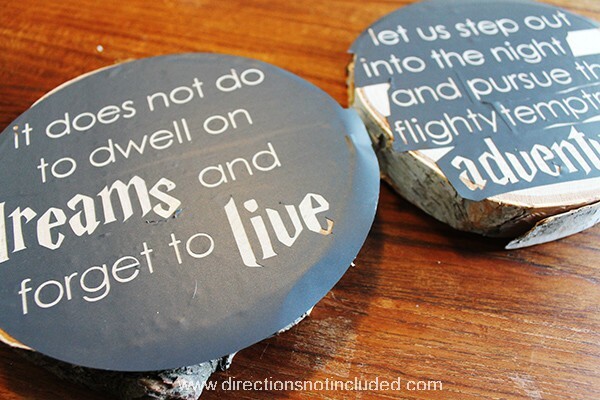 I picked two Harry Potter quotes I had seen her pinning, which were perfect for a nursery or kids room. Do you notice my mistake in the stencil below? 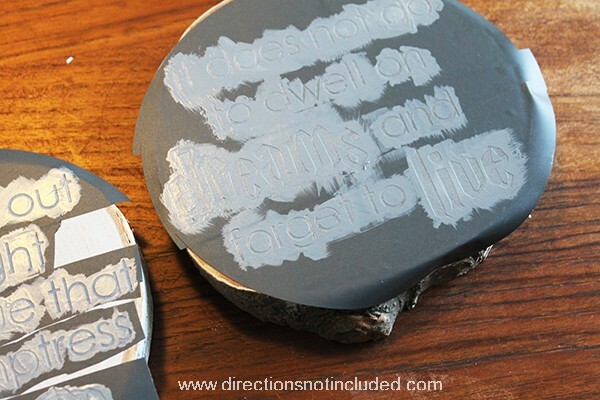 Save yourself time and make sure you make your stencils correctly so you are not going back and manually sticking the inside of letters back in (see the d, o, e, and a). Doh! I was in such a hurry to get these done I wasn’t paying attention. Thankfully, with a pair of tweezers it only took 5 extra minutes to clean up the letters. Here are the quotes all properly in place. Just like any vinyl stencil you use, make sure to press it down firmly around the edges to avoid the paint from spreading. I had some extra paint on hand from the Instagram display I made. It is actually the same Benjamin Moore Advance paint I used for the midcentury cabinet I posted about earlier this week. Since I didn’t prime this and it is natural wood, I made sure to give it a few light and even coats. I’m a very impatient crafter so I tend to not wait for things to dry completely. I forced myself this time and left them in front of a fan so I wouldn’t ruin them. And it was worth the wait because the paint did not bleed. I think they will be sweet additions to the room. The backs are flat so I’ll use some 3M picture hanging velcro so they can be easily moved around the room. 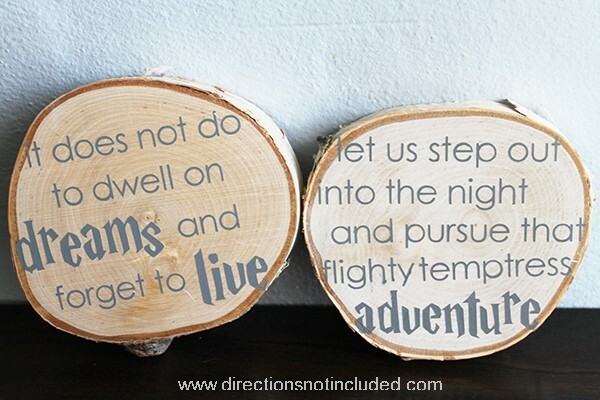 I think she’ll love them and so will baby when he/she is older and a major Harry Potter geek like us. 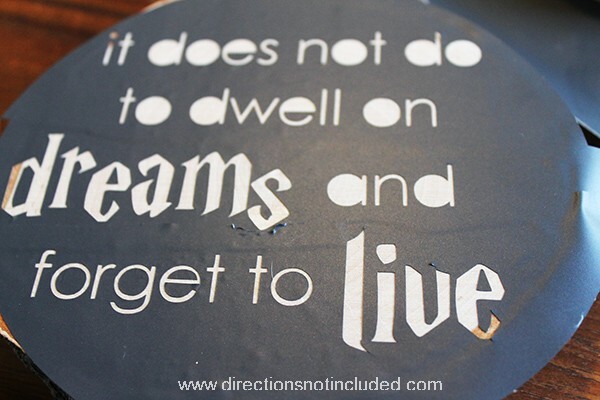 Have you seen any other cool Harry Potter nursery art or nursery art overall worth sharing? love these! love the quotes and the concept!